You Me At Six are a band that have been getting a lot of hype over the last 12 months, in that time they have toured relentlessly and built a healthy following. 'Take Off You Colours' therefore is a much anticipated release, which has been released on independent label, Slam Dunk Records. 'Take Off...' begins with 'The Truth Is A Terrible Thing' a standard pop-punk/rock song by a band of this caliber, filled in with added "woah-oh oh's" and sharp guitar riffs. 'Gossip' is a steady-paced track with a catchy chorus and a nice slow breakdown. 'Jealous Minds Think Alike' is the album's lead off single and starts off with a thumping beat and on the whole, is a song with a more thought out structure, rather than the standard pop-punk one, although the catchy chorus remains. Fan favorite 'Save It For The Bedroom' is next, a power chord-heavy affair and lead singer Josh Franceschi showing his vocals have impressed from the band's earlier releases. The albums title track follows this and consists the band can perform good guitar riffs and to an extent is a more edgier sound. 'You've Made Your Bed (So Sleep In It)' is a lyrically bitter song, which see's the band slowing things down before going into a well-paced chorus. 'Tigers and Sharks' and 'Always Attract' see's the band showing their somewhat "emo" side, with the former slowly building up to a near-angry and loud chorus. While 'Always Attract' is an acoutsic ballad, which is beautifully written, with female backing vocals, but at 6 minutes, may make the band's young fanbase restless. However the song does prove to be one of the album's highlights. 'If I Were In Your Shoes' is a radio-friendly rock song, through and through with added guitar solo. The album closes with 'The Rumour', where again Franceschi shows improvement from the band's early demo of the same song. The song itself has a cleverly written yet simple verse and ends up an anthemic build up, which will have the crowd's full attention during the band's upcoming UK tour. 'Take Off Your Colours' is better then I thought it would be and I would recommened listening to it, to those who have written off the band, as another "rubbish hyped band". This records shows the band have not let their quick rise to fame go to their heads, and have written a collection of songs that shows the band has potential to reach the level of success as bands such as, Fall Out Boy and Panic At The Disco. However at 51 minutes long it may have been better for the band to exclude some of the more filler songs from the album. 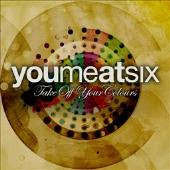 'Take Off Your Colours' is released through Slam Dunk Records next Monday. You Me At Six are touring the UK later this month with support coming from Houston Calls and Farewell. Dates can be found on the band's myspace.